These are two metals with a low density which means they are lightweight for their size. 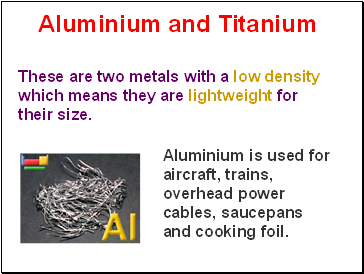 Aluminium is used for aircraft, trains, overhead power cables, saucepans and cooking foil. 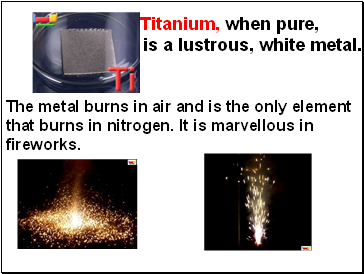 is a lustrous, white metal. The metal burns in air and is the only element that burns in nitrogen. It is marvellous in fireworks. 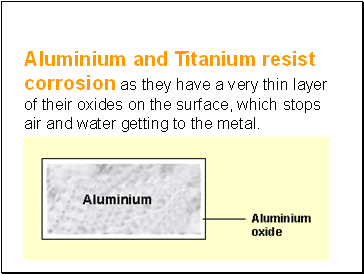 Aluminium and Titanium resist corrosion as they have a very thin layer of their oxides on the surface, which stops air and water getting to the metal. 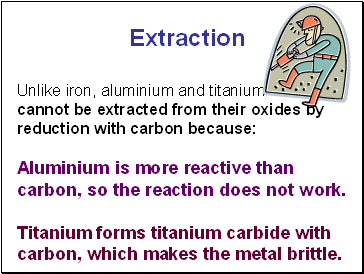 Aluminium is more reactive than carbon, so the reaction does not work. Titanium forms titanium carbide with carbon, which makes the metal brittle. 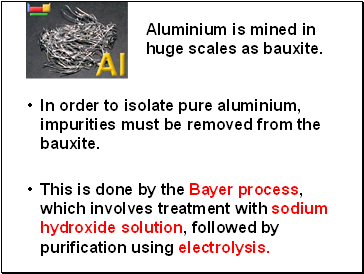 In order to isolate pure aluminium, impurities must be removed from the bauxite. This is done by the Bayer process, which involves treatment with sodium hydroxide solution, followed by purification using electrolysis. Aluminium is mined in huge scales as bauxite. 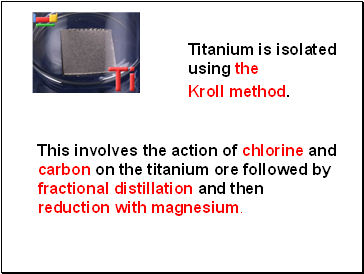 This involves the action of chlorine and carbon on the titanium ore followed by fractional distillation and then reduction with magnesium. 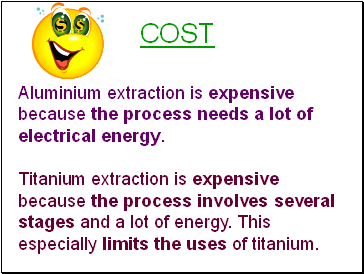 Aluminium extraction is expensive because the process needs a lot of electrical energy. 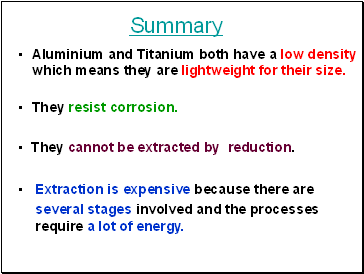 Titanium extraction is expensive because the process involves several stages and a lot of energy. This especially limits the uses of titanium. Aluminium and Titanium both have a low density which means they are lightweight for their size. They cannot be extracted by reduction. several stages involved and the processes require a lot of energy.